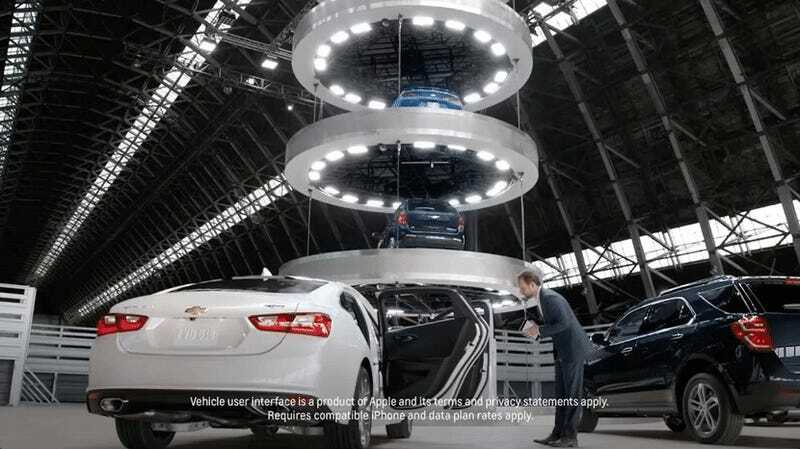 These days, almost every Chevrolet ad you see starts with a screen that says “Real people. Not actors.” and continues with a cringe-worthy dumbing down of the human race that makes you question everything. And in case you didn’t dislike those ads enough already, Chevy said they’re here to stay. If you’ve somehow been fortunate enough to miss out on the commercials, the dumbing down of our population consists of people—not actors!—stumbling over their words when reciting names of awards Chevy has gotten, being totally wowed at different arrangements of Chevy vehicles in a showroom (sometimes they’re behind doors and sometimes they’re on big, hanging platforms! ), and being told to describe things with emojis. The real people then decide that they want to buy a real Chevy, like, now. For real. But the manufacturer’s marketing team either hasn’t consulted a real human about the commercials, or seen any of the 50,000 results that come up when searching “Chevy commercial parody” on YouTube. Paul Edwards, the U.S. vice president of marketing at Chevy, told Automotive News that two years into the real-people theme, it’s valuable because “people are familiar with the tenets of the campaign.” He didn’t really elaborate on that familiarity. From where I sit two years in, there’s no sign that it’s losing steam. In fact, every month, like I said, it continues to pick up in terms of our ability to break through and drive opinion. For the foreseeable future, we don’t have a change in mind. Automotive News also reported that Nielsen ratings said the Chevy commercials “resonated with consumers in memorability, branding and likability,” which, um... sure. Regardless, Chevy’s keeping these ads around indefinitely. Here’s a parody to make you feel better. Laugh in denial of it all. Things will all be OK, eventually.